Are you having problems with your guitar? Does it buzz when you play it? Are the frets rough? Are the controls scratchy? Would you like them replaced with high quality parts? Would you like to replace your stock pickups with pickups or your choice? If you do Guitar Solutions Oxfordshire will be able to help you out at a reasonable cost with all work guaranteed. Guitar Solutions Oxfordshire is owned and operated by a local guitar and bass player who lives in Oxfordshire. 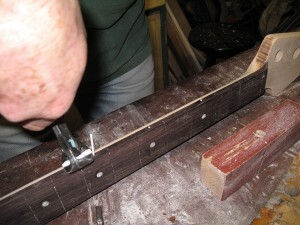 After many years of having to search for a local guitar repair person to set up and service his guitars decided to undergo training so that he could do the guitar repair work himself. He has now decided to branch out and provide a guitar repairs and guitar set up service so that you don’t have to search for a high quality, fully insured service in the local area. has undergone a significant amount of training to the highest levels and is fully confident of being able to achieve a highly satisfactory result for all of your set up or repair requirements. Guitar Solutions is your Warwickshire and Oxfordshire based guitar set up and repair service provider that will be able to assist you in making your instrument play and sound better. Passionate about guitars and believes in providing a bespoke service to each customer in order to meet their specific needs. He understands how much you value your instrument and undertakes to care for them as if they were his own. Whatever your needs contact Guitar Solutions Oxfordshire for an informal discussion about how to resolve your guitar problems. A price list and description of the options available is provided on the next page. All work is guaranteed to be of the highest standard and the hope of Guitar Repairs Oxfordshire is to exceed your expectations. We cover North Oxfordshire, South Warwickshire, South Worcestershire, South Gloucestershire and Northamptonshire.